Create a gorgeous visual to promote your latest design for a translucent bike bottle using Placeit's mockups! 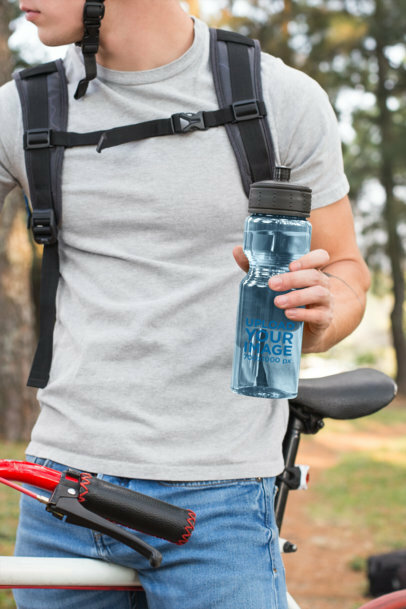 This mockup is a cool choice for you to show off your bike bottle designs since it's an amazing visual that will show your audience a relatable situation. Promoting your designs in a more realistic image is always better! 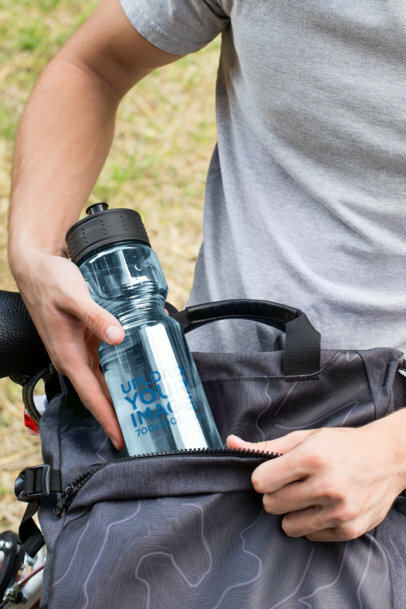 Use this cool bike bottle mockup to increase your sales revenue. It's a simple and effective tool to showcase your water bottle design. This mockup is a great visual with a sporty feel that is just perfect for reaching all of your audience and giving them an image they can relate to. 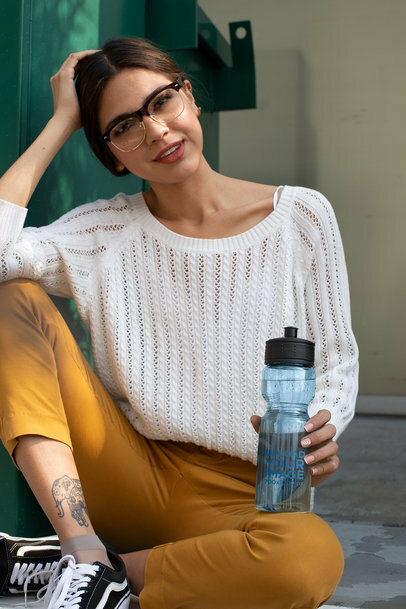 Imagine your sports brand's logo on a water bottle mockup, placed on a beautiful image that is relatable to your customers. Actually, there's no need to imagine it, because Placeit is here for you. 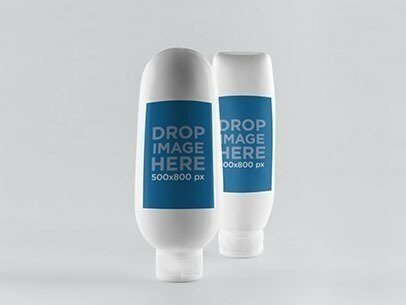 Just use this cool plastic bottle mockup and watch your sales grow as you give your customers a gorgeous visual that they can feel related to. Searching for a way to promote your water bottle designs? Look no further, Placeit has mockups just for you. 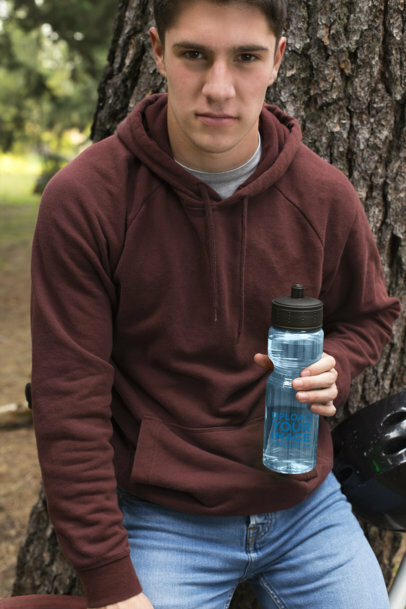 This one features a man holding a sports bottle. Your design will be the first thing people see! Awesome, right? Try it out now. Edit your water bottle mockup now. Got some cool water bottle designs? Reach your audience by promoting your designs with Placeit's print mockups! We create our mockups to be super easy to use, fast, and trendy. Like this one, featuring a man putting away his sports bottle. You can even change the bottle's color! Cool, right? Try it out! 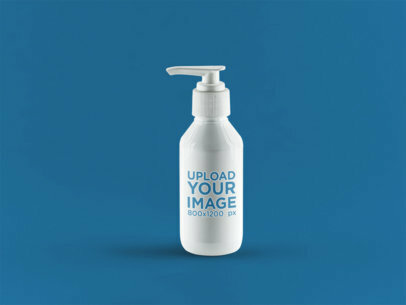 Promote your water bottle designs with Placeit's easy-to-use mockups. Our mockups are super trendy, functional, and the settings are amazing. This one even lets you change the bottle's color! Cool, right? What are you waiting for? Edit your sports bottle mockup now. 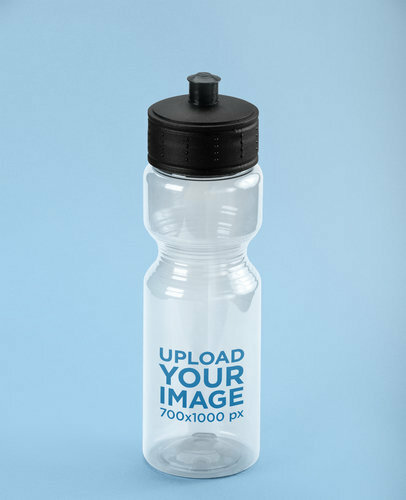 Promote your awesome Sports Bottle designs with Placeit's Plastic Bottle Mockups! Our mockups are made to be easy, fast, and functional. This mockup is trendy, sporty, and fun. You can even change the bottle's color. Cool, right? Try it out now. Made some cool bottle designs? Show them off with Placeit's water bottle mockup. Our mockups are super easy to use and don't require any additional software. You can even change the bottle's color. Try it out, it's easy. Edit your sports bottle mockup now. 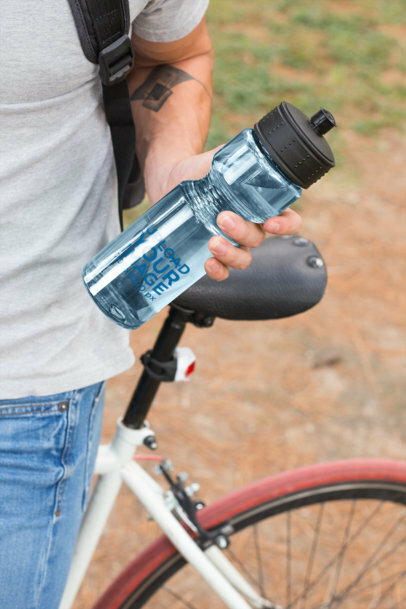 Create a gorgeous visual that will help you promote your latest design for a bike bottle using Placeit's mockups! This one is a cool choice since it features a city environment, there's a girl sitting by an electricity box on the street while holding her bike water bottle. Start now, use this bike bottle mockup and sell more bike bottles! 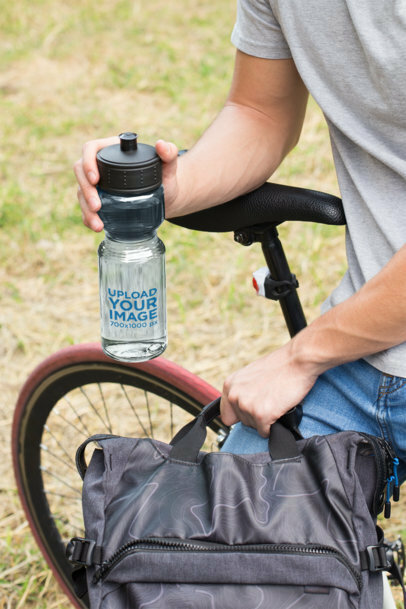 Create an awesome visual to promote your latest design for a translucent bike bottle using a mockup from Placeit that will put your design on the spotlight! 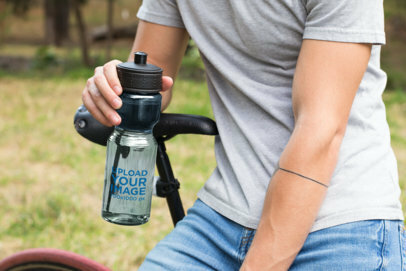 Start now, use this mockup and make a bike bottle mockup using a mockup with a studio set that will let you modify the water bottle color and background too. 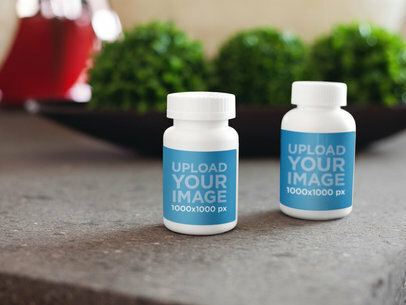 This label mockup features two white plastic bottles standing next to each other on top of a solid surface. Use this label mockup to help you showcase your business new design or idea and appeal to a broader consumer demographic. To customize this image all that's necessary for you to do is drag and drop an image of your choice onto the template so Placeit can do the rest of the work for you. Create amazing visual content you can start using right away with the help of Placeit and finally get your business the attention it deserves! Use this label mockup to showcase your newly developed product in a relatable way to potential consumers and catch their attention right away. This label mockup features a 1 gallon square plastic jug. Use this original photo mockup from Placeit as part of your product's visual marketing campaign and stand out form the competition. To customize this image just drag and drop an image onto the plastic jug on the template or input a URL and Placeit will do the rest of the work for you. Placeit allows you to generate incredible visual content in a fast and simple way, so stop hesitating and make it an essential asset of your marketing tools starting today! See more Label Mockups here! Use this original label mockup featuring a plastic jar over a smooth background to advertise your new beauty product and make an impression on your specific target market right away. To customize this image all that's necessary for you to do is drag and drop an image of your choice onto the template or input a URL address and let Placeit resize it and adjust it for you. 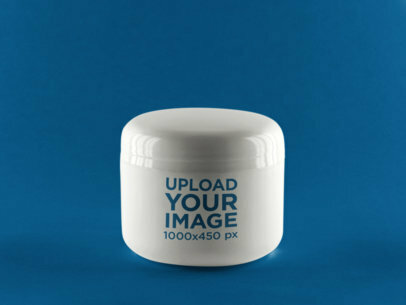 Get an up-to-date customized image you can start using right away within minutes and see how your ideas look displayed on the label on this plastic jar when making Placeit's marketing tools a part of your visual marketing campaign. 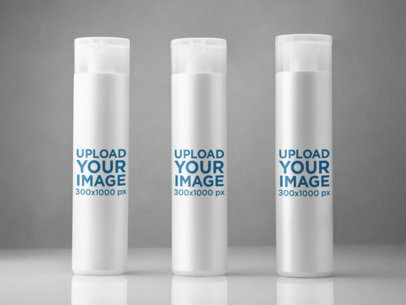 Use this label mockup featuring a set of shampoo bottles over a flat surface to advertise your business newest cosmetic product within context and leave a lasting impression on your potential consumers at a glance. To customize this label mockup just drag and drop an image of your choice onto the template and let Placeit resize it for you. Within no time you will get to enjoy amazing visual content! What are you waiting for? Start using label mockups to captivate your audience right away! See another Label Mockup here! Introducing a new beauty product into the marketplace can sometimes turn into a difficult task, especially when you don't have the right tools to do it. If you feel this is your case, then it might be time to visit Placeit and checkout our label mockups to help you solve this issue right away! 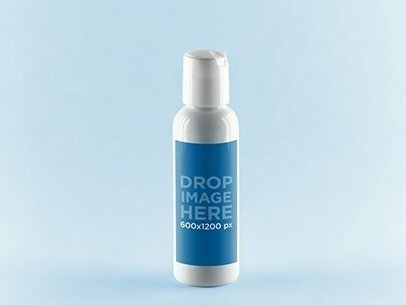 This label mockup features a small lotion plastic bottle on top of a flat surface. Customize this original mockup by dragging and dropping an image of your product onto the template and let Placeit resize it and adjust it for you. Make Placeit an asset of your marketing plan starting today and see how your ideas come to life! Thinking about introducing a new beauty product into the marketplace, but still can't figure out a way to do this in an attractive, eye-catching way for your consumers? No problem because at Placeit we might have the perfect solution for you, label mockups! Use label mockups to display your ideas within context and leave a lasting impression on everyone. This label mockup features a metallic cream bottle standing over a flat surface. Customize this image in just a matter of minutes and start using it as part of your visual marketing strategy right away by just dragging and dropping an image onto the template and let Placeit handle the rest of the work for you. Pretty amazing right? Waste no more time and make Placeit's marketing tools an essential asset of your marketing strategy right away! See more Label Mockups here! Start using real-life label mockups to advertise your business newest products and charm your potential consumers at a glance. 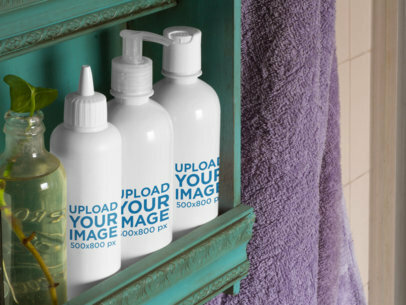 This label mockup features a set of cosmetic bottles standing next to each other on a bathroom wooden shelf. Make this great image an essential part of your visual marketing campaign by customizing it today; all that's necessary for you to do is pick an image you'd like to display on the bottles, drag and drop it onto the template or input a URL address and let Placeit resize it for you. Never had creating amazing visual content been this easy before! See another Label Mockup here! You just developed a new cleaning product, but still haven't found a way to introduce it into the market? Then, use this label mockup from Placeit to help you do this and appeal to your potential consumers right away. 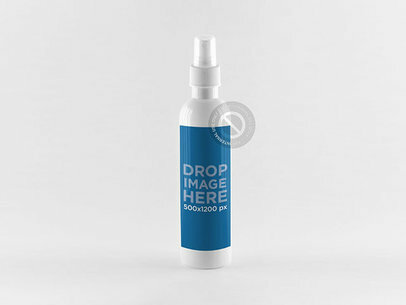 This photo mockup features a white spray bottle standing over a flat surface. Customize this original mockup by dropping a photo onto the template and see your ideas come to life. Your new product will look beyond amazing being displayed on this outstanding template. Mockups are great marketing tools! Besides being easy to use, mockups help you cut down on expensive marketing campaigns. Great right? Improve your marketing strategy today by making Placeit's photo mockups part of your business visual marketing campaign. This label mockup features a plastic spray bottle standing over a smooth surface. Customize this image and make it part of your product's visual marketing campaign today by just dragging and dropping an image onto the template and letting Placeit adjust it for you. Create amazing, eye-catching visual content within minutes thanks to the help of Placeit's marketing tools and leave a lasting impression on the market. 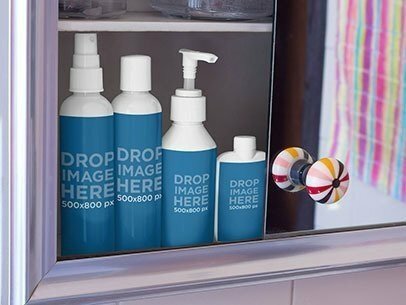 If you are looking for the perfect spot to display your cleaning products brand, this spray bottle mockup is the right one. The image features a white spray bottle over a sleek white background that can transmit a feeling of purity and a clean environment, which is just what you are looking for. 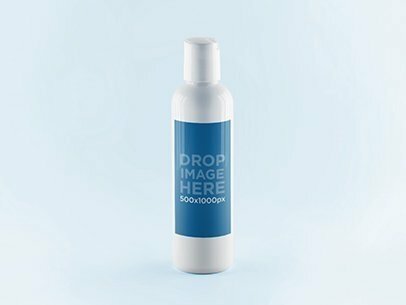 You can place any 800&#215;1000 px image on the spray bottle&#8217;s label and that will do. Give it a try! Make label mockups from Placeit part of you marketing strategy and start achieving success right away! Label mockups are amazing marketing tools because they allow you to showcase your ideas, new designs and products within context, making them more relatable and appealing to your potential consumers. 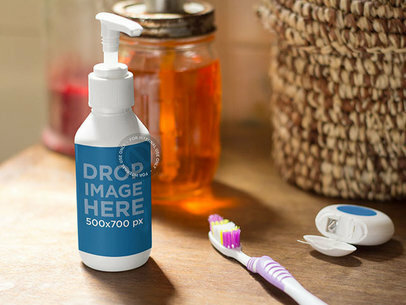 This label mockup for example, features a small cream bottle sitting on a bathroom countertop. Try this great real-life label mockup right away by inputting a URL address or drag and drop an image onto the template and let Placeit do the rest of the work. What are you waiting for? Start using label mockups now! See more Label Mockups here! This is a label mockup that will make your brand stand out from the competition in a professional, yet creative way. Take a good look at the picture, it features a plastic water bottle that seems to hold a refreshing beverage. 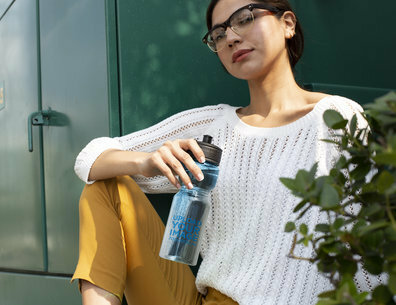 Use product mockups to enhance your marketing campaign, like this water bottle mockup that can feature your branding image. All you need to do is drop an image on the label and Placeit will deliver a compelling visual asset. See another Label Mockup here! 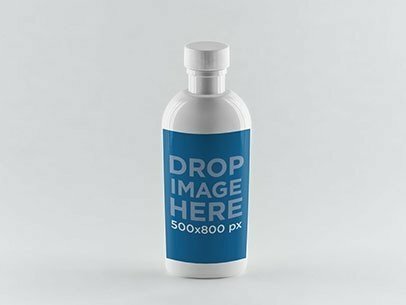 Use this bottle mockup from Placeit to boost your business newest product marketing strategy and achieve success within no time. 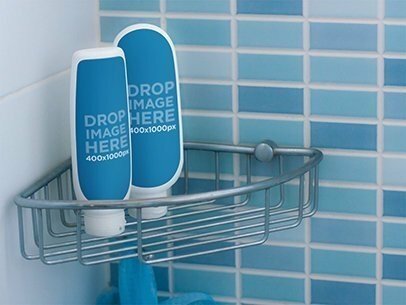 This label mockup features a set of two shampoo bottles in a shower. Make this mockup an essential asset of your marketing campaign right away by simply dragging and dropping an image onto the template and let Placeit resize it and adjust it for you. Creating amazing visual content had never been this easy until now, so wait no more and start using Placeit right away! See another Label Mockup here! Thinking about implementing a new marketing strategy to boost your business latest product? Then, Placeit's photo mockups might be just the right thing for you. 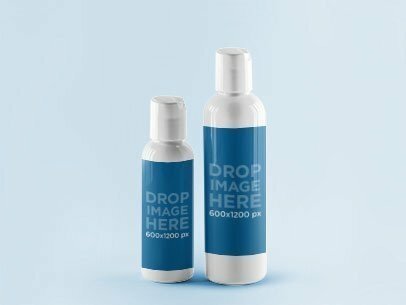 This label mockup features a set of two spray bottles standing next to each other over a solid background. Personalize this image by dragging and dropping an image onto the template or by simply inputting a URL and let Placeit do the rest for you. Now thanks to Placeit you will be able to create outstanding visual content within minutes! 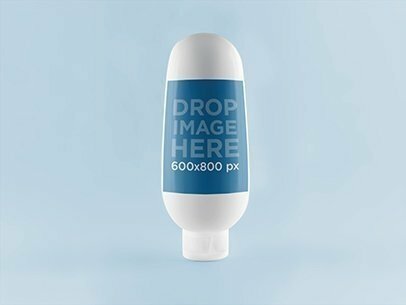 This label mockup features a cream bottle standing upside down on top of a flat surface. Use this original mockup from Placeit to help you display a new design or product and forget about expensive, time-consuming marketing campaigns. 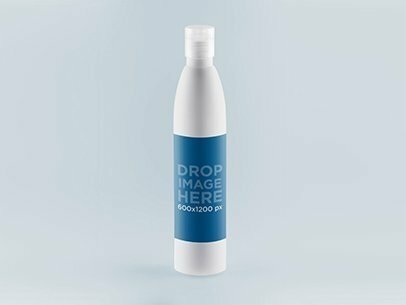 To customize this mockup, simply add an image onto the bottle on the template and see your ideas come to life within no time! Placeit's marketing tools are great because they make it fun and easy for users to create striking visual content! What better way to advertise a new product than by using a real-life mockup from Placeit like this one? 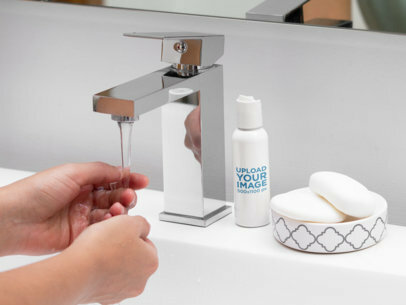 This label mockup features a soap dispenser in a bathroom next to a woman who is washing her hands. Make this original mockup part of your visual marketing strategy right away and appeal to your consumers at a glance. To customize it, all you have to do is drag and drop an image of whatever it is you are looking to advertise onto the template and let Placeit do the rest of the work for you. It's time to make and leave a lasting impression on your specific target market and with Placeit's mockups help, we can guarantee you that you will be able to achieve this in no time! If you want to see more PSD Mockup click here! Got a new design or idea you would like to display for the world to see, but haven't got the right visual marketing tools to do so? Worry no more because thanks to Placeit's label mockups now you can say goodbye to your problems. Placeit's label mockups are images that allow you to portray your ideas within real-life context to help you reach a broader target demographic. 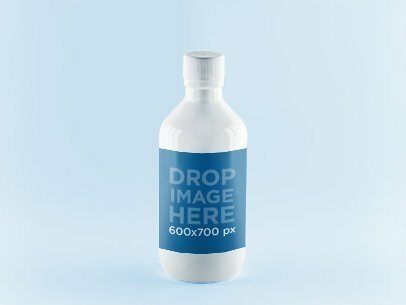 This label mockup features a white plastic bottle over a solid surface. 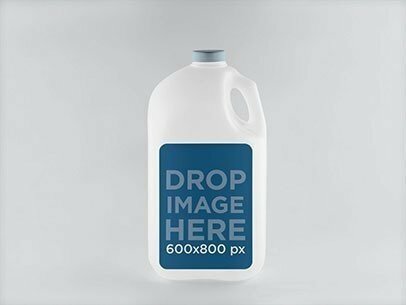 To use this label mockup just add an image of your choice onto the plastic bottle on the template and let Placeit resize it for you. Thanks to Placeit you will be able to create original, eye-catching visual content you can start using right away within minutes! This is a mockup template that will allow you to display your brand within a label that perfectly adjusts to the bottle. This is a packaging mockup that will do wonders for your branding and advertising campaign, especially if you just went through a redesign process and want to show off the outcome. Try using this label mockup on a bottle right away. Improve your business visual marketing campaign by making this bottle mockup the latest addition to your visual marketing tools and leave a lasting impression on your specific target market. It doesn't matter what it is you are trying to advertise because with an image like this the possibilities are endless. To customize this bottle mockup all that necessary for you to do is drag and drop an image of your choice onto the template so Placeit can resize it for you. It's time to update your marketing strategy and what better way to do it than with the help of Placeit! Market your ideas with the help of Placeit's marketing tools and make a lasting impression on your consumer demographic. This label mockup features a water bottle standing over a flat surface. Add this water bottle mockup as part of your product's visual marketing campaign and reach a wider range of potential consumers. To customize this image just drag and drop an image onto the template and let Placeit do the rest of the work for you. Placeit makes it easier and fun for you to create amazing visual content, so wait no more and make mockups an essential part of your marketing strategy starting today! Your beauty company is in need of a cool stock photo to help you launch your latest product visual marketing campaign? Then, this mockup might be precisely what you need. This label mockup features a set of cosmetic bottles standing over a flat surface. Customize this original mockup to help you advertise your products by just dragging and dropping an image of your choice onto the template and let Placeit adjust it for you. Your business ideas will look beyond great once you make Placeit's mockup part of your marketing strategy! See more Label Mockups here! This bottle mockup template is the perfect way for you to showcase your new brand or your business' new image right in the product! 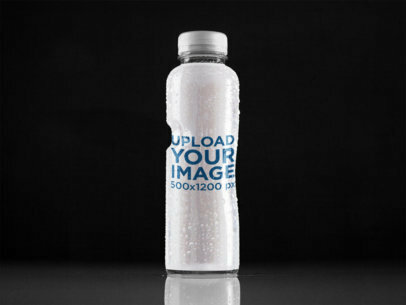 You will be able to add your own image straight into the bottle's label without needing editing software. 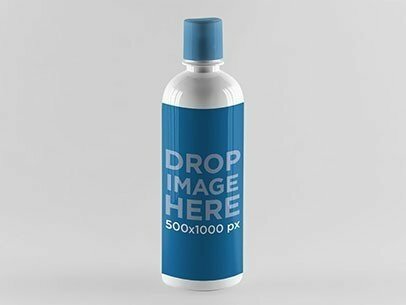 Use this bottle mockup template to showcase your new design and catch the attention of your consumer demographic. Are you a graphic designer? Have you designed a wonderful label for your client and want to showcase it for a presentation? 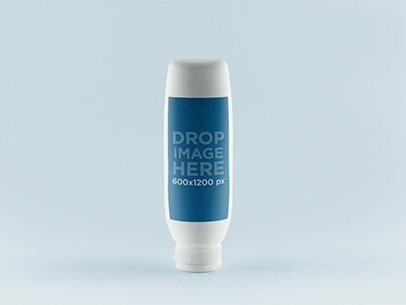 How about using this label mockup of a cream bottle that is upside down, standing on its cap. The background is a nice neutral grey that will help your design stand out much more. This photorealistic label mockup is ideal for any label design. This is a great mockup. 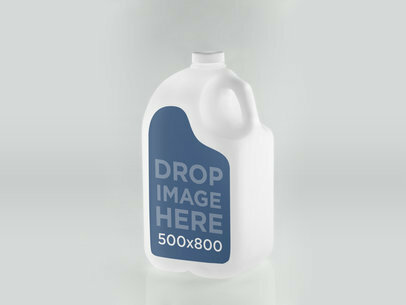 First of all, you can notice a white gallon with a label on it, in which you can display any image or brand. Also, this gallon mockup is laying over a sleek background that provides depth and brightness for a professional look. If you are looking for an object to place your brand and make it look like a real product, either it&#8217;s milk or some cleaning product, this is the stage for you. This stage delivers a crystal clear message. 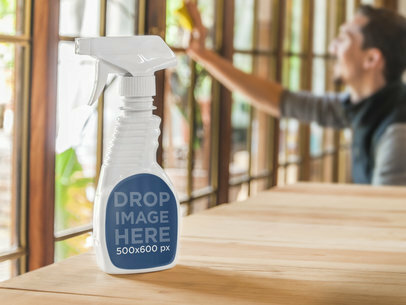 Really, it features a White Spray Bottle Mockup over a wooden table, there is a man cleaning a large window on the background and we can notice a garden outside. The spray bottle has a label to place an image so this is a great scenario to display a new cleaning product and share a positive user experience since the man in the background is making cleaning look like a simple task. 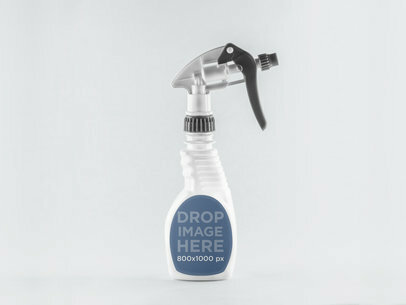 Use the spray bottle mockup, it allows a 500&#215;600 px image.